When the UPS driver brought in the box marked Rizzoli, I knew good things were in store. 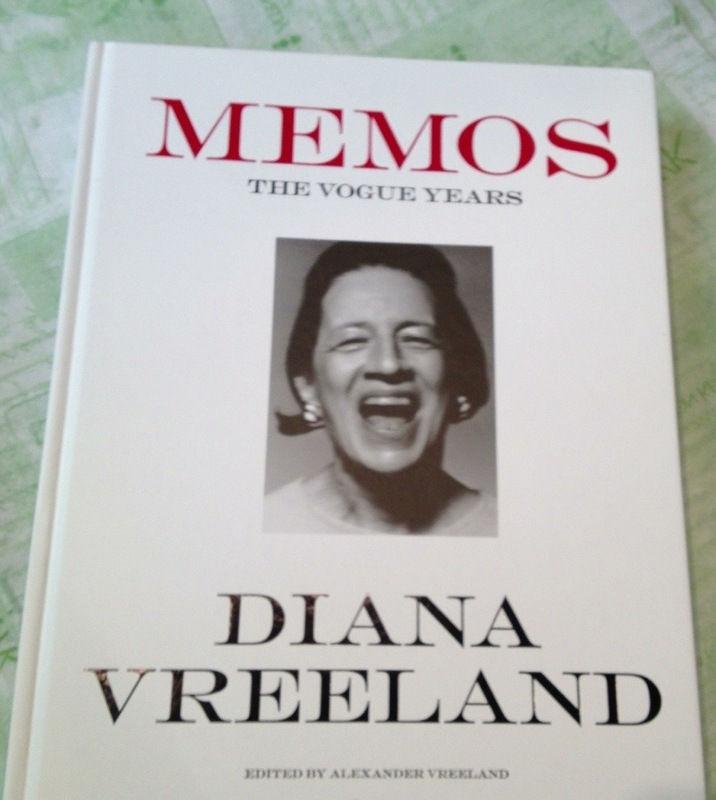 Our much awaited copies of the Diana Vreeland Memos book were finally here! I have been looking so forward to sitting down and spending time with this book, and boy oh boy, it has not disappointed. First off, I adore her. Simply adore her. Actually, those last 2 sentences sound/read very much like what DV would say or write. I have always found her fascinating. You might remember a post I wrote last year about the documentary, The Eye Has to Travel, and how much I thoroughly enjoyed it and highly recommended it. Same for this book. She was a character. A one of a kind. I think the world needs more characters. Her memos speak to her wit, attention to amazing detail and ultimately her humor. The gal had fun. The book is composed of copies of memos that were sent out while she was the Editor in Chief at Vogue. I love, love, love typewriters, and this is filled with page after page of typewritten memos. Most with her famous red signature as well as notes she added to the page in her handwriting. Memos to Cecil Beaton, Richard Avedon, her staff–all written with great style and flair. It is a look back to a time before texts and e-mails, a time when she ruled the roost in the fashion world. What a delight. Out last week on iTunes, the documentary about Diana Vreeland that I was incredibly excited to watch. Certainly growing up I heard and read stories about the Vogue editor and her eccentric style. The film did not disappoint in the least. Quite a few years ago we were treated by friends in Seattle who took us to see the play, Full Gallop. It was then that I became smitten with Mrs. Vreeland and her very to the point quotes. She says it like she sees it–which can be incredibly refreshing & witty. I was then in New York a year later and saw Full Gallop there, wanting to compare the two performances. After seeing this documentary last week, looking back, they both nailed it. “Style is everything. It helps you get up in the morning. It helps you get down the stairs. It is a way of life,” were her thoughts starting the film. Born in Paris, or Par-isss, as she would say, her family emigrated to the United States at the outbreak of World War I, moving to East 77th Street in New York. “I certainly didn’t learn anything in school. My education was the world.” She started work at Harper’s Bazaar in 1936 and remained there until here legendary run began at Vogue in 1962. “There is only one very good life, and that is the life that you know you want, and you make it yourself.” As her son Tim said in the film, “She always made it clear that she wanted us to be originals.” Mrs. Vreeland certainly was. In spades. The documentary is really a delight.